1) In a large pot heat some water with a couple tablespoons of vinegar until it is gently simmering. 2) Crack an egg into a soup ladle and slide the egg carefully into the simmering water. 3) Set a timer to about 3 1/2 min. Make sure you don’t overcook it! 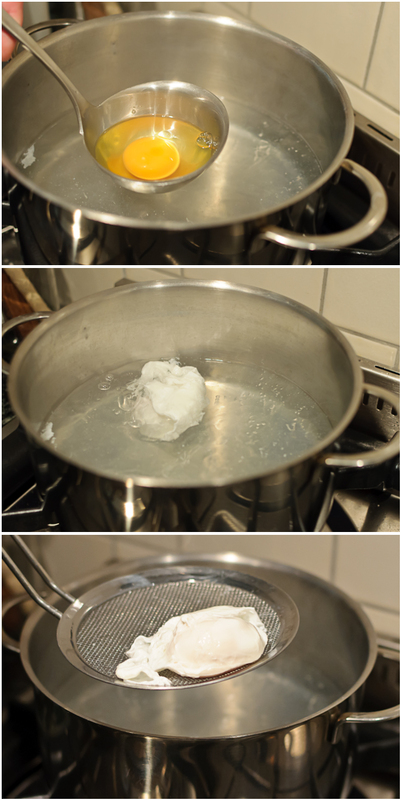 4) Take the poached egg out of the water, strain and place on a piece of paper towel. We would love to hear about your experiences with poaching eggs! my only attempt so far has resulted in something you could call egg-drop water 😦 – but will give your technique a try to break the egg in a soup ladle first! Egg-Drop Water sounds almost poetic! The ladle definitely helps. Good luck with your next experiment. My family poaches eggs all the time and often in large batches. I find using lots of salt and dropping directly into the water sufficient. For extra large amounts sometimes we will crack the eggs into a large bowl and slide the whole batch into the simmering water. As far as shape is concerned very fresh eggs are best.